See for yourself how outcomes like Solomon Group's are possible with the Mendix platform. True innovation is the product of having the right tools and frame of mind to recognize an opportunity to solve a new or existing problem. It was with the right frame of mind that Solomon Group sought the tools it needed to solve an internal business challenge, only to discover opportunities to become an innovator itself, to deliver rich, creative solutions to its clients, and transform itself in the process. Solomon Group creates immersive, audience-centric stories that educate, entertain, and engage. When the company designs and produces an event like the Essence Music Festival in New Orleans or Super Bowl XLVII, it handles virtually every detail — booking the venue, coordinating hotel stays, building the scenery in its fabrication shop, and providing the multi-media equipment. It does this across dozens of projects at any given time. To ensure that the firm’s employees and work functions stayed in sync, employees used spreadsheets, Word documents, and paper files to track projects. The company also used a custom application built with Quick Base. However, these processes became unsustainable. Solomon employees found Quick Base very limiting and simply stopped using it. As a result, project managers were wasting hours searching for information. The team experimented with a relational database product, FileMaker, but quickly realized that it, like Quick Base, wouldn’t meet the firm’s requirements. “It didn’t offer enough flexibility or customization to accommodate our processes. We knew we wanted to do this ourselves. We’re pretty technically savvy, but by no means are we coders. So, we started to look at low-code software development platforms,” Foucheaux says. While researching low-code platforms online, the team came across Mendix. After sitting with the Mendix team and learning the platform, Foucheaux and his team were ready to get developing. Within four months, Solomon Group built a custom ERP application on Mendix. “Going through the process of building the application and seeing it handle everything we wanted was pretty cool,” states Foucheaux. It became clear that Solomon Group was equipped to solve complex business problems when the firm began working on an event at a convention center. Citing capacity issues at previous events in the same venue, the local fire marshal decided that once a predetermined number of people entered the building, no one else would be admitted. This limitation severely impacted the ability of Solomon’s client and their sponsors to meet their business goals. And that’s exactly what Solomon Group did. Sensors on optical turnstiles fed data to a Mendix-built application, allowing event managers to see in real-time the number of people that entered, the number that exited, and available capacity in the building. The fire marshal allowed Solomon Group to implement their IoT-enabled turnstiles. As a result, the event garnered a 50% increase in ticket sales. 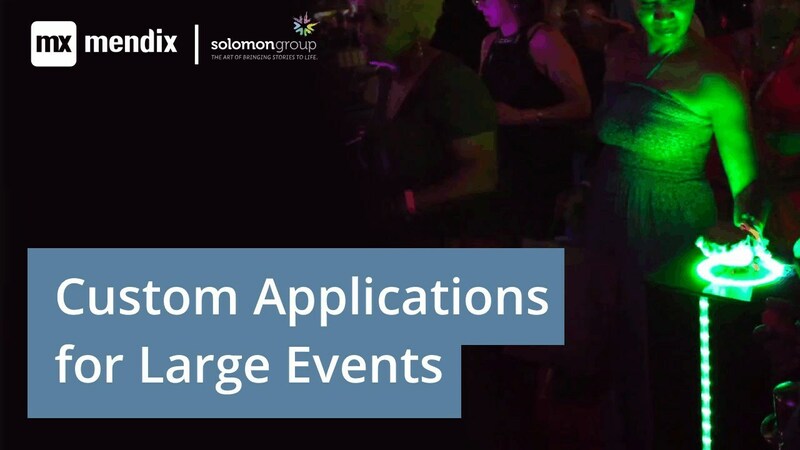 The project was so successful, Solomon Group invited a fire marshal from another municipality to see the system in action to solve a similar problem for another event. “Because we could monitor where people were inside the venue — room to room, and inside and out — that client was able to convince the fire marshal to let them sell 2,000 additional tickets to their event,” Foucheaux says. At $350 per ticket, this added an additional $700,000 in single-day ticket sales to the client’s revenue. While ease-of-use has been critical to Solomon Group’s success, the applications it builds are only useful insofar as Mendix is scalable and reliable. If an application doesn’t work, Solomon Group doesn’t get a second chance to get it right. “It’s critical that everything works and is reliable. It’s really hard to test that when you have a spike of users from four or five at the beginning of a week to 150,000 in the middle of the week and into the weekend. It’s critical that our apps are reliable and scalable on a moment’s notice to keep up with the demand so that everyone can have a great experience,” Foucheaux says. The business benefits Mendix delivers have exceeded the firm’s expectations. The business benefits Mendix delivers have exceeded the firm’s expectations. “When we first got into Mendix, we were literally just looking for something to build our internal system on. And now, every week, it seems a new need comes up, and someone says, ‘Hey, let’s go to Mendix and build an app for that,’” Foucheaux says. “Mendix has really been a game changer for us internally and externally. It’s allowed us to differentiate ourselves from our competitors that are primarily focused on the production aspects of events and use off-the-shelf management systems,” Foucheaux explains. Solomon Group currently has 20 applications in production mode, two of which are internal-facing and 18 that are customer-facing. The growing opportunity to build custom applications is even driving Solomon Group to expand its team. The firm is hiring people specifically to manage their Mendix application portfolio. “We bring stories to life. That’s what we do for our clients every day, and Mendix is a key tool with helping us do that by allowing us to build applications quickly, make changes quickly, iterate through different ideas with our clients, and really bring what they’re looking for to life in a very quick and efficient way,” Foucheaux says. As a result, Solomon Group has become singular in the entertainment production marketplace for the types of problems they can solve for their clients. Turnstiles set up outside an event space track, in real time, attendees arriving and leaving the space, sending data to a Mendix application that gives event managers and safety personnel insight into attendance, allowing for increased ticket sales. By providing 9,000 VIPs with an RFID wristband at a large event, event management employees in a dozen VIP areas were able to tell with mobile devices or a turnstile which areas each VIP had access to, significantly streamlining a previously paper-based process.